Guided Discussion Groups for Parents of Gifted or Twice Exceptional Children are molded to the needs of our community. They can span eight weeks and have up to 18 participants. See below for the current or upcoming class offering. Discussion each week revolves around the chapters in A Parent's Guide to Gifted Children, which is included with the fee. The fee covers two adults involved in the child's life, the 350+ page comprehensive book, weekly handouts, and a free lending library. You will receive the book prior to the discussion group's first meeting. The discussion group uses the SENG Model Parent Group (SMPG) format. The discussion group provides guidance and parents can discuss parenting methods that promote positive growth and prevent behavioral and emotional problems in a supportive environment. It is important to remember that the guided discussion group is not a therapy group nor is it considered an advocacy group. Any parents are welcome to attend, and parents do not need to have a formally identified child. It is best if two adults involved in the child's life come each week. This can include aunts, uncles, and grandparents. 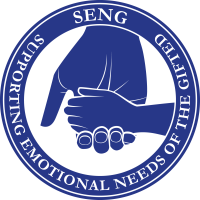 SENG groups are designed to help parents connect with other parents in a meaningful way. To facilitate this, groups are limited in size. Registration will be on a first come basis. If there are more interested people than space allows, parents will be added to a waitlist for future discussion groups. If we have fewer than six households register, we will have to cancel because of the difficulty of maintaining momentum in discussions with such a small group. If cancellation happens, your cost will be refunded. Our 2018 free SENG Model Parent group will be on the evening of Friday, August 10. Up to 40 people will be able to register for this free experience. See the 2018 Parent Invitation for more information.